The Council Episode 3 – Ripples, didn’t have the splash I was expecting. The game so far has been a deeply enjoying episodic narrative with exciting twists and turns that always left me wanting more. The twist at the end of Episode 2 signals that we might finally start getting some answers to all the questions that have been building thus far throughout the plot. Unfortunately, Episode Three – Ripples fails to deliver those. Nonetheless, there were some moments that I really enjoyed. Now that you’re into episode three and have spent a good amount of time in delving further into the intrigue and strangeness of the island, there is a sense of growing unease on the island. You can feel you’re not exactly welcome, and that is starting to show on the characters as well. Most notably, my young detective is starting to succumb to the attrition of always being on guard. I’m near constantly out of action points and always scrambling around for more sweet resources to survive the next confrontation. It was quite fun to have to negotiate more carefully negotiate with the other characters now, focusing on exploiting weaknesses rather than experimenting. And the characters themselves are just as interesting as ever. With a few minor hiccups, the script is solid and the characterization still stands strong, with each member of the council fleshed out and full of mystery. Where episode three let me down, though, is actually in its story and the puzzles, which have been among the highlights up until this point. The story beats this time feel muddled and rushed. It’s hard to go into much detail with spoiling anything but the biggest problem, and one that plagues these sort of games, is in the discussion of things. After certain key events happen, events that definitely warrant further explanation, you are not given the opportunity to talk about them. It really slumps the story when you’re hung on this event and your character, who one moment earlier seemed as confused as you did, seems to quickly forget about the whole thing. While some of the confrontation and dialogue are exciting, witty and revealing, these moments are hard to get away from. The puzzles, on the other hand, are just a bit sloppy this time around. It’s a real shame but a lot of the time I felt the instructions were not clear at all, especially for the very last puzzle of the episode. While a bit of ambiguity is always fun, these specific puzzles seemed to leave the player completely in dark. The final puzzle also only lets you try once, and had me reloading the chapter after I failed just to try and work out what I was meant to do. Parts of this Ripples episode just felt rushed. For instance, one section has you returning to a location from the previous episode and reminds of the code needed to access it. Except the code spoken and the code written in the subtitles were different. I couldn’t understand how a mistake like that could have been made by the developers, and luckily it wasn’t exactly an issue, but the attention to detail seems to have slipped a bit here. Where the story succeeded still makes in interested in the next episode, but the quality comes back to where it was for the first two. The graphics and music still hold up and unique and in keeping with the tone, but overall this was but far the weakest episode to date. With what the series originally managed to do, it’s a huge shame the game couldn’t keep it up. Hopefully, Ripples will be the one bump in this otherwise great series. 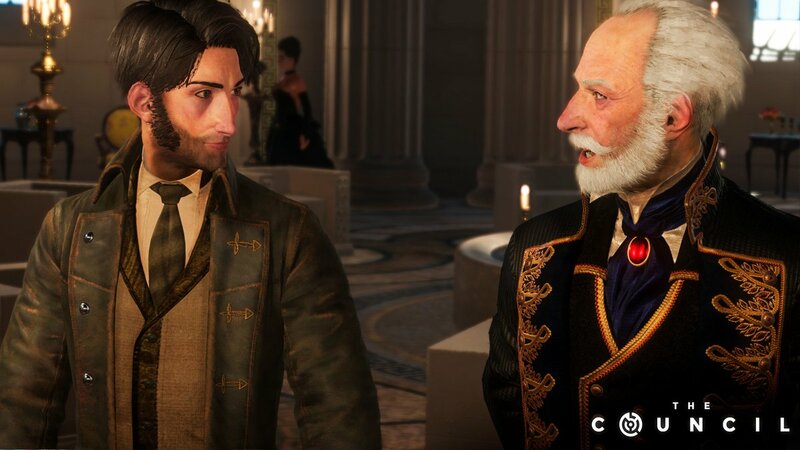 Hopefully my complaints can be resolved in the next episode, but Ripples was not as enjoyable as I was hoping after the first two episodes of The Council.